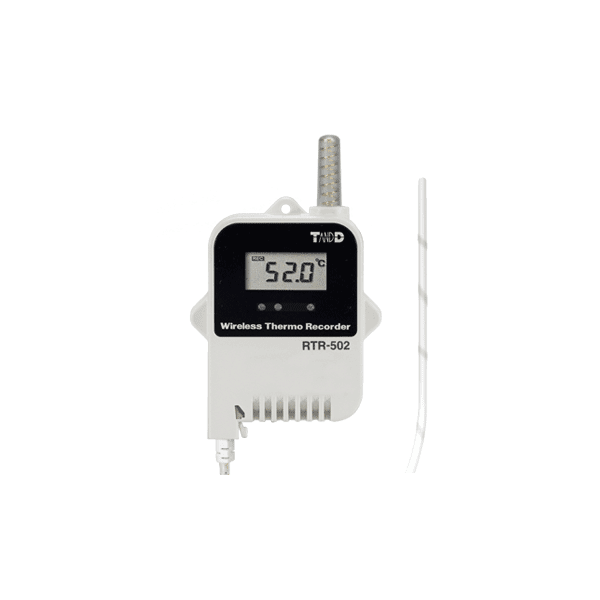 The RTR-502 Wireless Temperature Data Logger by TandD offers a variety of exclusive RTR-502 optional sensors to meet your needs; from ones with stainless protection to those that can be used in water in addition to the include TR-5106 sensor. Please contact us to learn more about the sensors. Recorded data can be downloaded from the RTR-502 data logger (Remote Unit) via wireless communication with a Base Unit. The wireless communication range between a Remote Unit and a Base Unit is about 150 meters [500 ft]. By registering an RTR-500 as a Repeater, it can be used to expand the wireless communication range. 16,000 readings means you can record every one second and still log four and a half hours of data, or at a recording interval * of 60 minutes you can keep logging for 666 days. A Base Unit can download via wireless communication one RTR-502 Remote Unit at full logging capacity (16,000 readings) in about two minutes. The RTR-502 Data Logger uses one Lithium Battery (LS14250). At normal temperature, if recorded data is downloaded once a day or if monitoring is carried out once every ten minutes, the estimated battery life will be about ten months. Model names which include “L” are designed with a large capacity battery pack. Under the same conditions, L-type models will continue for about four years without the need to change the battery. The RTR-502 allows for a variety of commercially available sensors to be connected to the included Input Module.